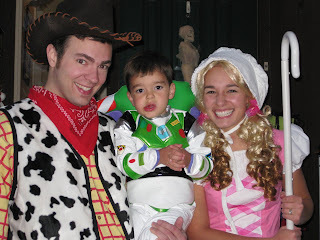 This year we did a Toy Story theme because that is what my little boy LOVES. 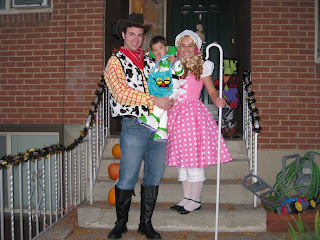 He was Buzz Lightyear, Will was Woody, and I was Little Bo Peep. I'd do a little pattern review but I mixed and matched so many patterns for my dress, it's not even funny. One for the bodice, one for the sleeves, one for the neckline, one for the skirt, my own design for the inlay on the front, plus my own petticoat pattern, a bonnet pattern, and a pajama pant pattern for the bloomers just shortened. In the end, it turned out just the way I wanted. (Thank you Nanna for strategically planning a "Liam Day" play date for a whole day last week so I could work on my dress.) What was I thinking? Will's vest was just a regular vest pattern. His shirt was from a thrift store. 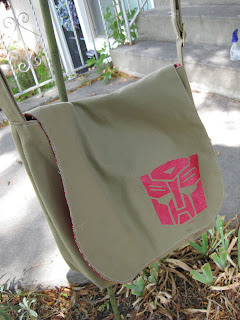 I dyed it a darker yellow and then used freezer paper strips to paint, yes paint on the plaid. Four small bottles of fabric paint and many hours later, Voila! Not too difficult, but it took a lot more time than I expected. Story of my life. Liam's Buzz outfit was purchased from Disney online a couple of months ago, clearanced for $10! Plus $10 for shipping. That shipping can kill a person! But I was TOTALLY willing to pay it so I didn't have to make a Buzz Outfit. That's a costume I could never do as cool as a storebought one. Wow!!!! I. am. in. awe! What a great talent. And such flippin cool costumes!